Hi, we are UMM, an experimental pop music band. Since 2017 we are playing together and touring different venues in Belgium and the Netherlands. We won or nearly won during several local music contests (Verse Vis, De Zes, …) and Radio 1, one of Belgium’s national radio channels, played our first single called ‘Papercut’. We are very eager to record our first EP and we aim to spoil you with five or six tracks. During a show in summer we met Jeff Claeys, a producer, and we almost instantly had a good feeling about working together. Jeff Claeys played in Admiral Freebee (BE) and did (among others) produce records of bands like The Van Jets (BE), Millionaire (BE) and The Jon Spencer Blues Explosion (US). We just started our pre-production sessions in January 2018 . Recordings will start near the end of January at the closed sessions studio (BE). Our goal is to release our new EP single early March. 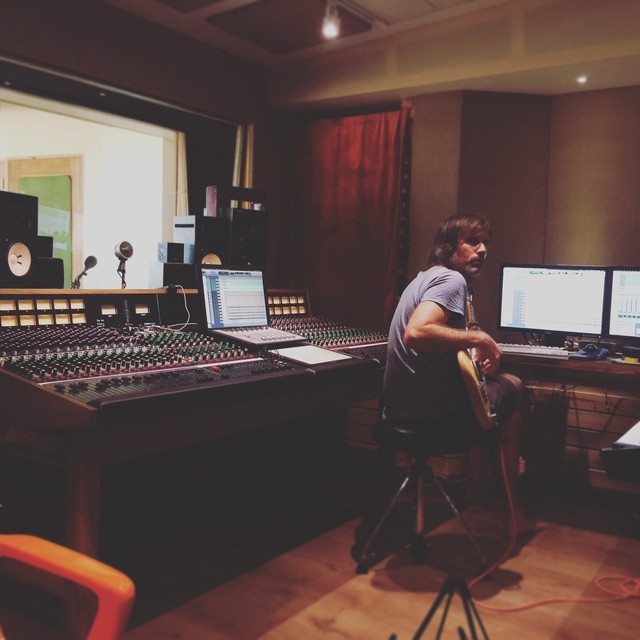 Afterwards the whole (EP) will be released early automn (September 2018) after producer Jeff Claeys finishes the record in his home-build studio in Costa Rica (for the curious ones amonst you for more information: see link below). 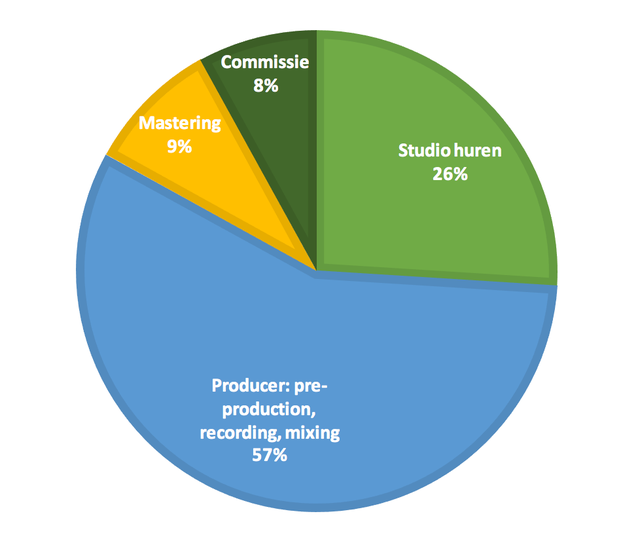 We will need a budget for hiring the recording studio, the production and mixing, the mastering and artwork. All bandmembers will chip in their part of the funding, but we can’t fund the whole project ourself. Therefore, a reward-based-platform seemed an appealing idea to us in order to turn our dream of a first EP into reality! Fear not, because you don’t need to be a true altruist at heart in order to be able to support us. Many exciting products are up for grabs at insanely low prices, thus don’t suppress your consumerist urges and award yourself a bargain right now. In exchange for your support, you can choose to buy our EP, book a concert, … Feel free to take a look around (see list on the right). All of this involves paying the studio and our producer, Jeff Claeys. Musicvideo made by KRU and Lucas Selfslagh (specialist 3D-video, see also link below) for the first single of the ep. In case we don’t collect the whole budget, the Ulule-campaign fails and the gifts so far are returned to our sponsers and it’s likely we will need to postpone the release of our ep. But we are very optimistic people… We even think one step ahead: If the project goes well and we collect €1500 more we will be able to release the EP not only on CD but also on VINYL. No mather what contribution you'll make, we would like to thank you very deeply for your interest and support. We feel only as big as the enthousiasms of our fans, listener, audience, critic and lover. Spread the love, come to one of our concerts, talk to us! We would like to know who you are! KRU = Karl Kipper en Fru Pintér; originally from resp. Estonia en Hungary. They have a passion for traveling and stayed in Ghent (BE) for a while to study at the art academy, KASK. That’s how KRU and UMM met. 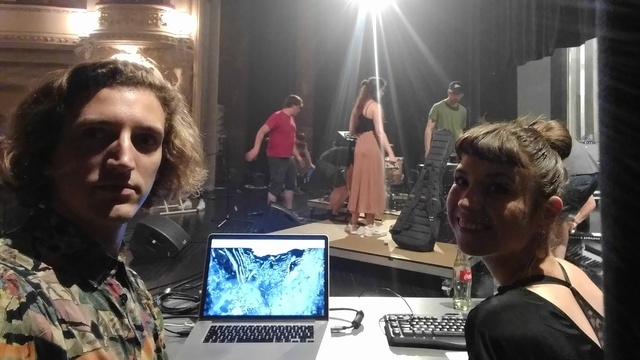 KRU made live visuals for UMM and a second opportunity to work together followed almost instantly. At the moment they’re gathering ideas for the artwork for the ep and together with the know-how of Lucas Selfslagh -3D-video- they’ll come up with a great musicvideo for the first single. Thank you!! You'll get a warm, loving group hug from UMM. Where, how and when is up to you! No cd-player? No worries... You'll get the ep in digital format. Thank you!! Thank you!! You'll get our new album on CD + digital and prior to the release. You'll get our new EP on CD + digital, signed -with a lipstick-kiss from a bandmember of your choice- and prior to the release + Linoprint postcard made by Lise. You will receive our new EP on CD + digital, signed, warm hugs from Roos and Brent and a skype session or digital video in which we sing a lullaby specially made for you. A proven cure for bad dreams! Music and chocolate is a divine combination! You'll get our new EP on CD + digital + chocolate mousse for 2 made by our beautiful Rose. Questions about delivery: send us a message. Did you know we have one of the best chefs in our team? Jonas will prepare the best chilli sauce for you. Delicious in your spaghetti or to season all kinds of dishes. You will receive one bottle and a personal card with cooking tips to use the chili + a digital link to our "hot song": hot pepper love. You will also receive the EP on CD + digital. You will receive access to our EP-release concert and you can bring a friend! Afterwards you're invited to share a pint/hot chocolate milk with us! You will receive the signed EP on CD + the digital version and a crazy group hug. You will receive our new EP on CD + digital, signed and an instrument lesson of your choice. Choose between a guitar lesson from Jonas or Lise, a drum lesson at Brent's, singing lessons or piano with Roos or learn everything about the bassguitar from Hanne. Send us a message to discuss and pick a date! Looking for an original song for your love, a romantic wedding first dance song, a goodbye-song, a song with your name in it, ...? UMM shares love and pain and creates a unique song for you! Make a proposal and we will provide you with the recording digitally or on CD if desired. Haute cuisine for 4 people! You and your partner are invited to diner with us on a high culinary level (we can also come to your house, if you like). Lise and Roos will play some umm-songs acoustically for you during the aperitif and chef Jonas takes care of the cooking! Mmm... Delicious! You also receive our new EP on CD + digital, signed and with a personal thank you! Have a blast with UMM as a DJ! We will put your house on fire and play many hot records. Bring your dancing shoes! You will also receive the new EP on CD + digitally with the favorite party hit-list and guilty pleasures from UMM attached! 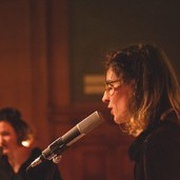 UMM performs an acoustic performance at your place! You can expect a unique set and original revisions of umm songs. As icing on the cake you have the option to ask a request-number that we will play for you in an umm version. On top of that you will receive the EP on CD + digitally and signed. Full-concert by UMM with live visuals. Everything included! We play a full-set and who knows you will hear the new songs that will be released on the EP! You will also receive the EP on CD + digital and a personal thank you in an original package at the event itself (surprise!). If desired, your personal name or company name can be placed as a thank you on the CD-cover. A blissful day with UMM for you and your partner and other friends! We prepare a unique and customized 'recipe'. We take you on a walk through the city of Ghent and let you discover nice places where you will be warmly welcomed. We play a unique, acoustic private concert at a special location and cook an extensive meal for you. You and your companions also each receive the EP on CD (+ digital), signed and with a personal thank you. Fun stories and entertainment are guaranteed with this gift!